What Can Sleep Apnea Teach Us About Sleep Deprivation? Around 25% of my medical practice is devoted to sleep related disorders. Without question, the most common sleep disorder I diagnose is Obstructive Sleep Apnea (OSA) [Click HERE for a link to my guest blog article written for Dr. Samuel Bledsoe’s blog, Bariatric Freedom] Most believe insomnia would be the most common disorder, but that type of patient rarely visits my office. Why you may ask? Typically, because their family physician treats them with sleeping aids to band aid the problem, or they never complain because they do not recognize poor sleeping habits as a problem with a solution. Americans do not value sleep. I see it daily, and unfortunately I see the price my patient’s pay in their overall health. The symptoms most commonly associated with poor sleep hygiene are daytime fatigue and poor work performance. However, would it surprise you learn that inadequate amounts of sleep have also been linked to heart disease, high blood pressure, elevated insulin and thus blood sugar levels, worsening of asthma symptoms, and even death? To learn why, look at one of the most common sleep problems, Obstructive Sleep Apnea. OSA is a condition where you have intermittent pauses in breathing (apneas) while you sleep. As you cycle through sleep, typically, you move from the lighter phases of sleep (Stages I and II) into the deeper stages (Stage III and REM). 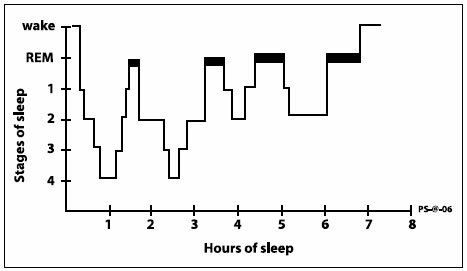 The graph below illustrates a fairly normal sleep cycle in a healthy young adult. I might point out that recently state III and IV sleep were combined into once stage known as Delta sleep in the sleep medical literature, and the hypnogram below still has the old nomenclature. When you have intermittent apneas at night, usually from your airway closing on itself, it leads to at least a 10 second pause in breathing. As your oxygen goes down, your carbon dioxide goes up. It is this carbon dioxide that eventually reaches a level which tells your brain that it is time to breathe! The key is when you start to breath again, you almost always experience what we call an arousal. This means your brain waves, or EEG, shows a shift to a lighter stage of sleep, usually all the way back to wake. Just as quickly as you woke, you fall right back asleep, but at a lighter level. Therefore, if you have moderate sleep apnea, you may stop breathing 30 times an hour, and thus wake up 30 times an hour! Of these, you may actually be aware of only once that you wake, but your brain is aware of each and every time. What is the result of this very intermittent and choppy sleep? Symptoms! Classic symptoms of sleep apnea include feeling sleep deprived upon waking, morning headaches, drowsiness while driving, mental fogginess in the morning, fatigue, sexual dysfunction, and getting busted snoring in public places. An analogy I tell patients is to imagine you slept 8 hours overnight; however, during this sleep period you were awakened every 30 seconds, then you immediately fell back asleep. Obviously, you will not feel refreshed! This is a life with sleep apnea. It is important to note that you do NOT have to be overweight, or even snore to have sleep apnea! Sleep apnea is caused by a narrow upper airway that has an abnormal tendency to close when relaxed. If your airway has this propensity, you are at risk of developing OSA. If you are at risk and gain too much weight, your chances increase dramatically. Therefore, obesity makes OSA worse, but does not necessarily cause it. Yes, I do diagnose 115 pound, 35 year old females with severe sleep apnea. If you have these symptoms and they are unexplained, see a certified sleep physician. Do not solely rely on how you feel. Let me say that again, having sleep apnea is not necessarily related to poor life choices. Like many disorders, you can inherit the tendency to have problems that can lead to poor health. So, what does this have to do with anything you ask? Let me just lay out a few of the hormonal changes that occur with sleep apnea. -Cortisol is bad for you. It’s bad for sleep, it’s bad for your insulin levels, and it’s bad for your blood sugars. Cortisol normally reaches its low right before bed time, which allows for an easy transition from wake to sleep. Sleep should be a relaxed time when your “stress-hormones”, of which cortisol is one, are at a low level. Chronic sleep disruption from OSA leads to both, a slower level of cortisol decrease as sleep approaches, and a general increase in cortisol levels all night. Given that cortisol increases insulin levels, which increases glucose levels and your risk for obesity and diabetes, this is clearly a problem. This elevation in cortisol also makes controlling a diabetic’s blood sugars difficult if they have untreated OSA. -The yin to cortisol’s yang is growth hormone (GH). GH levels typically rise during the night as you sleep. This is important, because GH has the ability to counteract insulin and grant you some relative protection against insulin resistance syndrome. -Leptin is your friend. This hormone essentially triggers to your brain that you are full. Leptin also appears to be affected by sleep amounts! Studies in patients subjected to sleep deprivation, in large and moderate amounts, show a significant fall in leptin levels. This is because your bodys fat cells, which secrete leptin, are signaling to your body to eat, even when it is full! So yes, poor sleep makes you hungry. -Grehlin, works basically the opposite of Leptin by stimulating the appetite. If you had to guess what sleep does to Grehlin levels, what would you say? Yep, sleep deprivation leads to abnormally high levels of Grehlin and thus hunger. -This is just the tip of the iceberg. The sleep medical literature is constantly finding new links to hormones and metabolism. As things evolve, I will try to keep you informed. So, now that I have potentially bored you all to death, what does this all mean? OSA patients have chronic sleep disruption from the disease. However, a result of the everyday choices we make, many of us also suffer these hormonal consequences. Think of the amount of sleep you need as a checking account. You need to deposit a certain amount every night, in order to make withdrawals the next day. If you fail to make nightly deposits, debt will accumulate. Unfortunately, if you miss thirty minutes here, an hour there, and never make it up, the debt starts to accumulate fast. After continuing this habit, your sleep debt has accumulated to such a large amount that you are bankrupt. You are tired, cranky, sluggish at the gym, hungry, stalled on your weight loss, stressed…get the picture. The cause of this common picture is the hormonal consequences detailed above. WHETHER YOU HAVE SLEEP DISRUPTION FROM OSA OR CHRONIC PARTIAL SLEEP DEPRIVATION, THE CONSEQUENCES ARE THE SAME!! The Paleo world tends to focus way too much on food, and forget about other aspects of health. As a sleep doctor, I would sayAmerica’s overall sleep health grade is an F minus. We don’t value sleep. How can you want to be your best, do your best, have the best time possible without giving your body the proper rest? It won’t work. Like I said above, the hormonal landscape of sleep and how it affects your everyday life is a work in progress. We just do not know everything there is about the neuroendocrine nature of sleep to connect all the dots. However, we have connected a few important dots. -We have mortality data demonstrating the risk of dying is 30% greater for untreated OSA at any point in your life. -European data recently showed a significant increase in the mortality of individuals who reported sleeping less than 6 hours a night…regardless of BMI or lifestyle! So people, no matter how “in shape” you think you are, how many pull-ups you can do, or how little carbs you eat…lack of sleep will catch up by making your long-term health worse. Don’t get caught thinking you are above the fray because your WOD times are always best! Get your sleep, invest in your health, you’ll be glad you did. Great post! There’s no doubt that Americans in general don’t get enough,nor attempt to get enough, quality sleep. Thanks for the great explanation of WHY sleep is important. I’m a 5ft, 103lb, petite female who has been eating paleo over a year now. I’m guessing I need to see a sleep doctor. I’ve had headaches and periodic migraines for YEARS. I’ve been to a neurologist and a chiropractor. I always feel tired and like my brain is in a fog. I have no trouble going to sleep; however, staying asleep is a problem. I wake up so many times, roll over and go back to sleep. My room is dark, no cell phones or TVs in the room. My husband and I, on work nights, shut all technology off by 9pm and dim the lights to read, talk or play cards while we wind down for bed. We are usually asleep by 10pm and the alarm goes off at 6am. I am always awake at least 30 minutes before the alarm and cat nap until it goes off. Maybe a sleep doctor would be able to help. I would certainly look up a board certified sleep doctor in your area. It sounds like you get enough sleep, but you are still tired. With some simple questioning he or she can determine if you need an overnight sleep study, a daytime sleep study (MSLT), or very likely both! One thing is for certain; at your age, size, and with the amount of sleep you get, you should not be this tired. Don’t settle for how u feel, it’s not normal!